One of the most requested features for PDF Product Vouchers has been the ability to redeem vouchers online, similar to coupons. Well, ask and ye shall receive — we’re excited to share an update for online redemptions today! PDF Product Vouchers has always worked well for printable vouchers, which could only be redeemed at location. These are most often used for in-person store events, such as redeeming a free gift, a seat at a course or tour, bookings like a massage; each of which is a single-purpose voucher (redemption as a 1:1 exchange, voucher for product / service). Online redemptions venture into store certificate / gift card territory, which requires far more in terms of tax handling on both the initial purchase and the redemption, as vouchers vs. gift cards are treated very differently in almost every country. Before we could consider adding online redemptions, we needed to take care of a lot of groundwork by introducing multiple redemptions, as well as voucher types and tax assessment. This was necessary to ensure merchants can comply with tax regulations. I’m happy to announce that with our latest release, online redemptions have finally arrived! Online redemptions are enabled by default for all new voucher templates. 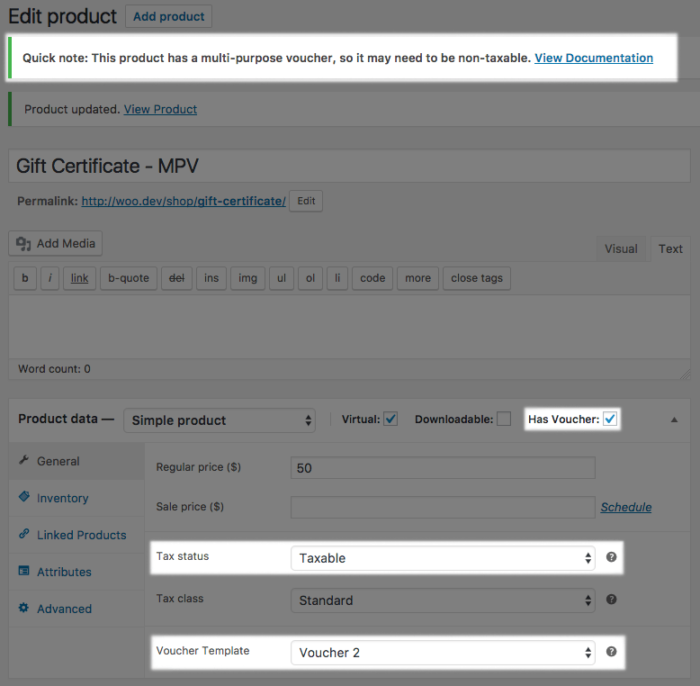 To enable support for any existing voucher templates, you’ll need to ensure Allow online redemptions is checked in the voucher customizer screen. 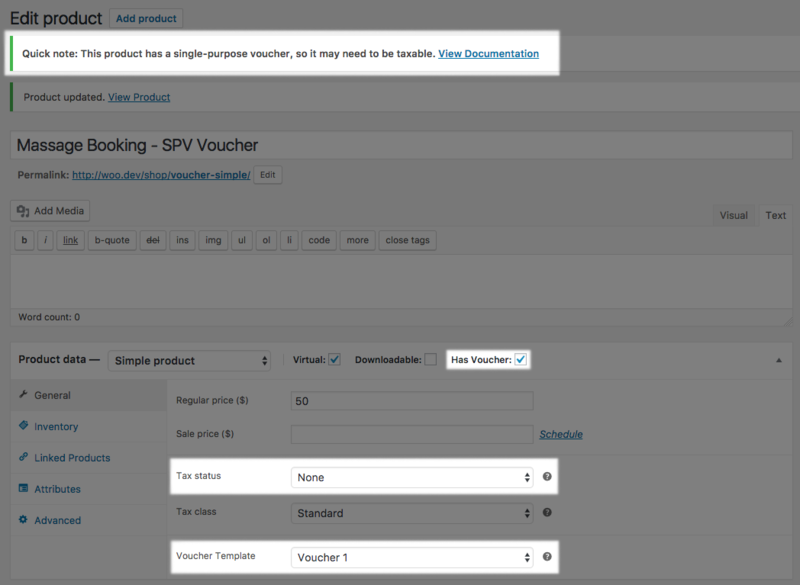 Redeeming vouchers online is very simple: the customer simply needs to enter the voucher code in the coupon code field. PDF Product Vouchers will automatically validate the voucher code and ensure that it’s still valid for use: has not expired, is not already redeemed, and can be used for the products in cart. That being said, there are a few differences in how single-purpose and multi-purpose vouchers are handled. Most countries define two basic types of vouchers: single-purpose and multi-purpose vouchers. These are generally taxed differently when sold to customers in a store, along with whether they assess tax on items when they’re redeemed. 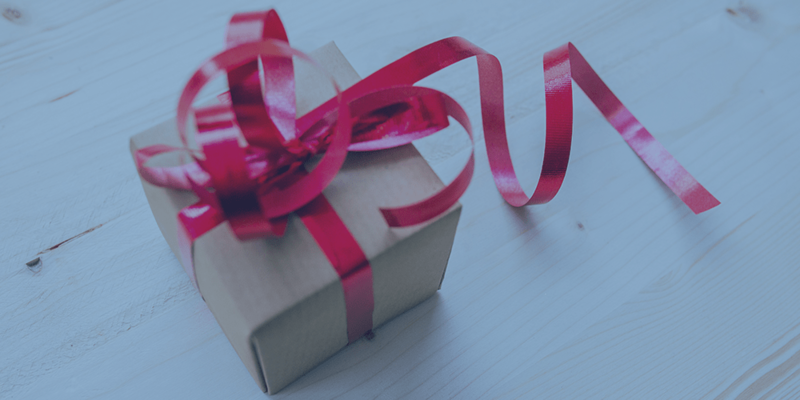 Based on the type of voucher, the plugin will hint at taxable status, but ultimately you are responsible for knowing tax regulations by which you should abide. If you’re not sure whether a voucher should be taxed at purchase or not, please consult your tax attorney or accountant. For example, the EU has good resources on taxable status of different vouchers, and International Tax Review has an overview of voucher types; US laws are similar in scope, but ultimately tax compliance is your responsibility as a merchant. Multi-purpose vouchers (MPVs) are defined as vouchers that can be redeemed on any product or service. This is a more like a gift card, store cash, or gift certificate, as this type of voucher can be used on any item in the store. Since the voucher can be redeemed on any product, the tax status of the goods ultimately being purchased is unknown when the voucher / certificate is purchased. As such, MPVs are typically non-taxable in many countries. Instead, tax is assessed on the items being purchased at the time the voucher is redeemed. If the product that sells the voucher has “Tax Status: Taxable”, you’ll be alerted to potentially change this to Tax Status: None. 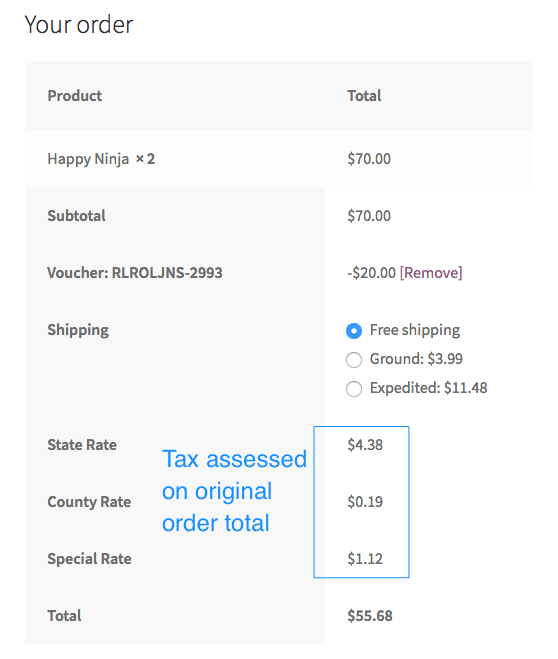 When a multi-purpose voucher is redeemed online, the voucher amount is not deducted from the subtotal, but rather from the total including taxes. Think of it like store credit. Say we have an MPV with a $50 value. When purchasing a product that costs $100 and is taxed at 10%, the order total is $110. 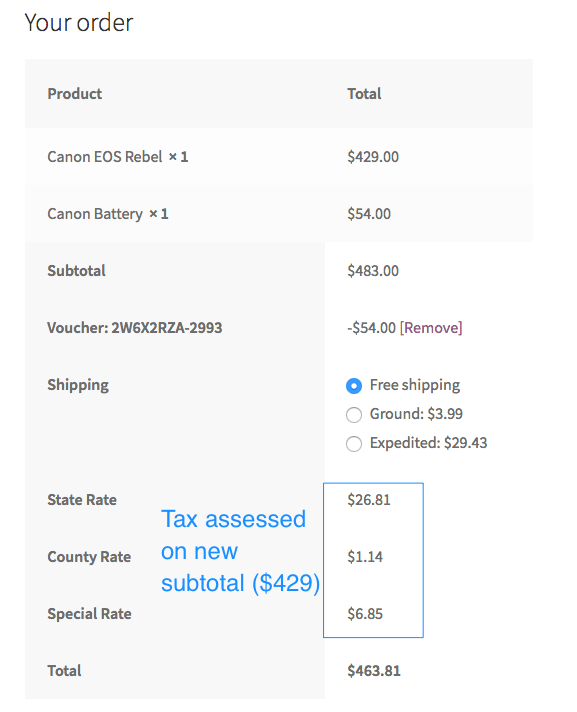 If we then apply the MPV to the cart, the order total is $100 + 10% tax – $50 voucher value, which is $60 in total. Note that the tax is still assessed on the full price ($100), not on the order total. This is because taxes were not assessed at the time of purchasing the voucher, but rather at the time of redeeming the voucher. Single-purpose vouchers are defined as vouchers that are redeemed for a single purpose, such as a specific good or service. This is a true “voucher” in that it’s “traded in” for the desired product, such as a free gift, or service, such as a booking (like a massage appointment). Since the tax class of the purchase (what the voucher is being redeemed on) is known at the time of purchase, single-purpose vouchers are typically taxed at purchase. This also means that, since tax is assessed on purchase, no tax is assessed when redeeming the voucher. If you attach an SPV template to a product and this product is marked as “Tax Status: None”, PDF Product Vouchers will alert you that you may want to review your tax settings, as many countries require these vouchers to be taxable. Since these vouchers can only be exchanged for specific products, there is an additional step involved to make online redemptions work. For these products, it’s necessary to set which vouchers can be used to redeem them. Note that a single product may be redeemed by multiple different SPVs and an SPV may also be designated to redeem multiple different products. This may seem like violating the SPV definition from above, but it’s not: it simply allows using a single voucher to redeem a few different products, where the customer has to make a choice. For example, a spa may sell a massage voucher that entitles the holder for a single treatment, but they can choose from a few different options, which are all priced the same and taxed the same. In order to use the voucher online, customers must add the redeemable product to cart and enter the voucher code in the coupon code field. 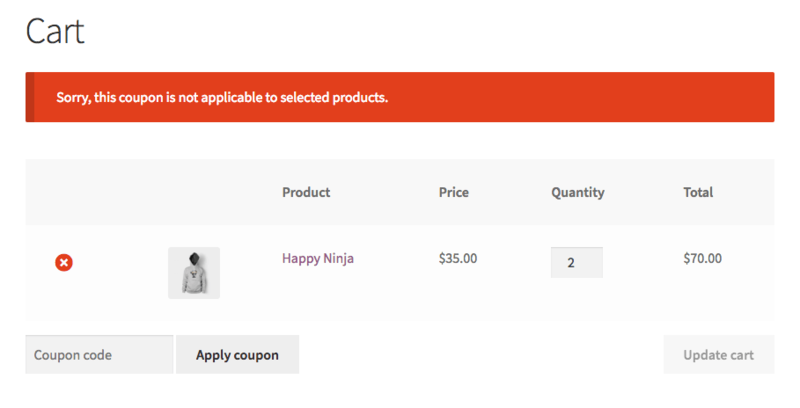 If the product in the cart is not redeemable by that voucher, an error will be shown. Note that if the voucher entitles multiple quantities of the redeemable product, this is taken into account as well. Partial redemptions are also supported when redeeming vouchers online. Customers do not need to use up all of the voucher value at once, given their cart value is less than the voucher value or has fewer products than the voucher entitles them to redeem. In the case of MPVs, if the voucher value exceeds the cart total, only the cart’s total value is redeemed and the rest of the voucher value is good for another purchase. In the case of SPVs, if the voucher entitles the customer to redeem multiple quantities of a product, they can redeem them one-by-one, a few at once or all at once. For example, if the voucher is for 5 x massages, the voucher can be used to redeem a single massage and the rest can be redeemed later. There are a few other improvements and fixes in PDF Product Vouchers 3.4.0 – you can find the full list of changes in our changelog, but here are a couple we’re most excited about. When an order that was used to purchase a voucher is refunded, cancelled, or failed, the remaining value of the voucher will now be automatically voided. This works with both full order refunds or with partial refunds, where only the voucher item is fully (or partially) refunded. We are now requiring WordPress 4.7, since it became apparent that earlier versions did not work well with the voucher template customizer. I can’t hide how excited I am to finally introduce online redemptions! I know that for some merchants, this has been the one thing missing from PDF Product Vouchers and it’s now here. We’re eager to see how this release will help you to sell more and serve your customers better. As always, don’t hesitate to leave a comment or contact us to leave your feedback!